Evan is an ice cream MANIAC. He loves just about any ice cream you can imagine. 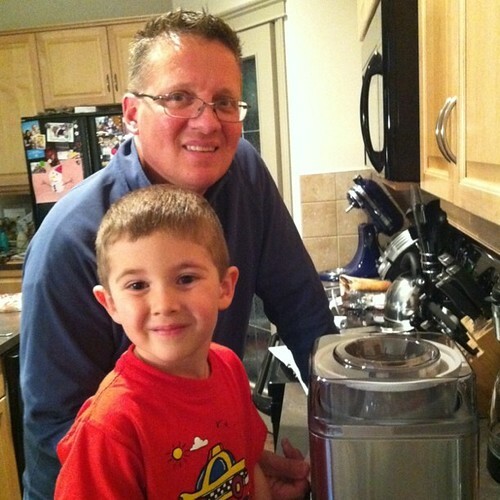 So….when an ice cream maker came up at the charity auction at work, I had to bid on it! I really wanted to make vanilla ice cream first but I was over ruled. We decided to use the homemade chocolate ice cream recipe out of the ice cream maker manual and it turned out pretty tasty. I will be branching out & making some other recipes soon. Some I want to try are: Homemade Vanilla Bean Ice Cream and Caramel Macchiato Ice Cream. Yum! I can’t wait to figure out all kinds of new combinations. Maybe I’ll even try to recreate Cherry Garcia from Ben & Jerry’s (my all time favorite flavor). Combine cocoa powder & sugars. Add whole milk and mix until the sugars are dissolved (about 1 or 2 minutes). Add whipping cream and vanilla extract. Mix well. Pour into prepared 2-quart ice cream maker. We have the Cuisinart Pure Indulgence ice cream machine. It took about 30 minutes to freeze to ice cream consistency. If you want firmer ice cream, scoop ice cream into an air tight container and freezer for 2 hours. Remove from the freezer 30 minutes prior to serving. Evan loved making his own ice cream. Gosh I want one so bad. Must whisper into Santa’s ear this year! Tell him that they were on sale at Sears the other day. Hope you get one soon! evan looks sooooo much like dewey in that picture! I will definitely be trying this… almost every recipe that came with my KitchenAid ice cream maker has eggs in it! Only the sorbet didn’t. Yeah…I’m not a big fan of raw eggs in my ice cream! Me neither. It took me awhile to be comfortable with raw egg whites in my icing (I pasteurize them, and there is a super-easy way to tell it’s hot enough), but I’m not at all knowledgeable with pasteurizing yolks yet! I’m so excited you bought an ice cream maker! The ice cream is SO AMAZING when you make it yourself. I plan to try all sorts of recipes, from mango to mint, cherry, etc. I’ll keep you posted!